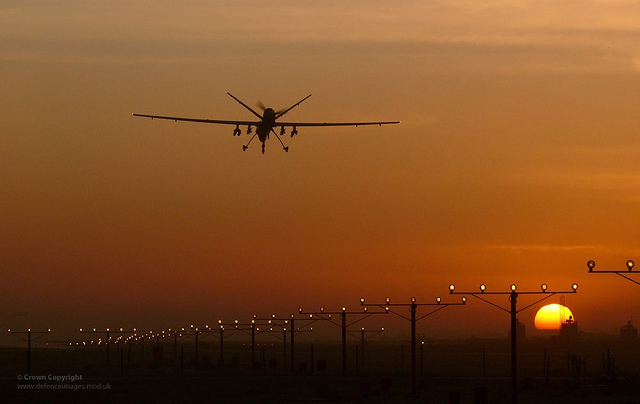 MQ-9 Reaper lands in Kandahar, Afghanistan; Image courtesy of Flikr user Defence Images. Note: What follows is a very thoughtful email, in response to my essay, “The Death of the U.S. Air Force & The Rise of the U.S. Air Machine Force.” Due to the specific nature of the writer’s role in piloting unmanned aircraft, the Air Force has asked him not to divulge his name (only initials). I wonder if the organization would ask the same for an A-10, F-15, or F-35 pilot? I read your recent post about the future of the Air Force and the related role that Remotely Pilot Aircraft (Merriam-Webster be damned) have to play. While the article is in many ways compelling, I believe that it broadly misinterprets the effects of RPAs on the future of strategic thinking in the Air Force and beyond. Instead, I believe that RPAs have a valuable role to play in achieving strategic ends instead of tactical goals. The crews of RPAs increasingly understand the need to be some of the most strategically aware members of the Profession of Arms. When a JTAC is calling for fire right now, the natural inclination is to fire a missile, right now. Only a crew that understands the strategic importance of waiting the extra moment, of checking one last time for collateral concerns, of making sure that the target is who the JTAC thinks it is, will be able to exercise tactical patience and stop another blow to Afghan public opinion. The F-15 pilot who doesn’t know why he is there will fire immediately. The RPA crew that understands that the strategic harm of civilian casualties is worse than temporarily losing a mid-level target will not. In a larger sense, during future conflicts or tense peacetimes, RPA crews can allow their tactical loss for the strategic benefit of de-escalation. It would be obviously unacceptable to ask traditional pilots or soldiers on the ground to make this sacrifice. Beyond this internal awareness is the ability of RPA crews to oversee other players during engagements. A good crew is able to not just keep itself from harming public opinion, but also to keep others from doing the same. An RPA will often serve as the primary, if not only, consistent source of information available for ground forces, and must provide the most complete picture to the JTAC interpreting it. Only a strategically aware crew will be able to know what the most crucial information is and where to find it. A well-educated crew will also be able to see and interpret mistakes before they happen, catching strategically-harmful decisions before they are carried out. As RPAs become more ubiquitous, this extra, persistent pair of eyes provides safety that cannot be replicated in manned aircraft limited by long standoffs, high speeds, and short on-station times. What’s more, the RPA community relies on officers as young as second lieutenants to understand and implement these strategic concepts. Part of the reason you founded the War Council was a professor claiming that the military didn’t need “second lieutenant strategic thinkers”. By equating “sending in the drones” to giving up on strategic thinking, you discredit one of the strongest examples of second lieutenants, as RPA pilots-in-command, using strategic judgment. In a broader sense, the RPA community is not the end of Air Force humanity, but instead a group that can preserve the role of the strategically-aware officer from bars to stars. This transition is not uniform among the branches, but the other services seem to have moved in similar directions. I went through RPA pilot training with the first group of USMC officers to be selected for the program. These officers have gone on to supervise groups of enlisted UAS operators, where they will be expected to exercise strategic judgment as the RQ-7 Shadow is fitted for weapons. If they have not already, the Army will also need to develop supervisors or preferably operators that understand the strategic implications of their platforms. The driving principle behind these changes is inherent in the technology of unmanned platforms: being further removed from the field of battle allows strategic thinking to trump immediacy and self-preservation. “Drones” need not be the mindless death of company-level strategy – they can instead be the tool that allows it to flourish.